Below is the latest information on current work underway to renew the Cannon House Office Building during the Cannon Renewal Project. The north wing of the Cannon Building (Independence Avenue) will be closed beginning the weekend of February 23, 2019. Access to all floors, including the basement, in this portion of the building will be unavailable until the work is complete at the end of 2020. The stairwells and elevators in this section of the building will not be accessible during this time. Access from the Cannon Building to the U.S. Capitol (Cannon Tunnel) and Longworth Building will be available at all times. For your safety, please adhere to all construction signage. See below for building entrance status and hours. Monday-Friday, recess hours: 9 a.m. – 5 p.m.
As the north wing of the Cannon Building is closed, staff-led tours can continue to access the U.S. Capitol from the basement Rotunda. When tour lines are long, the queue will proceed down the basement corridor on the west side (New Jersey Avenue) of the building. While waiting to go through screening, please do not block access to offices, elevators, stairwells, etc. along the tour line. 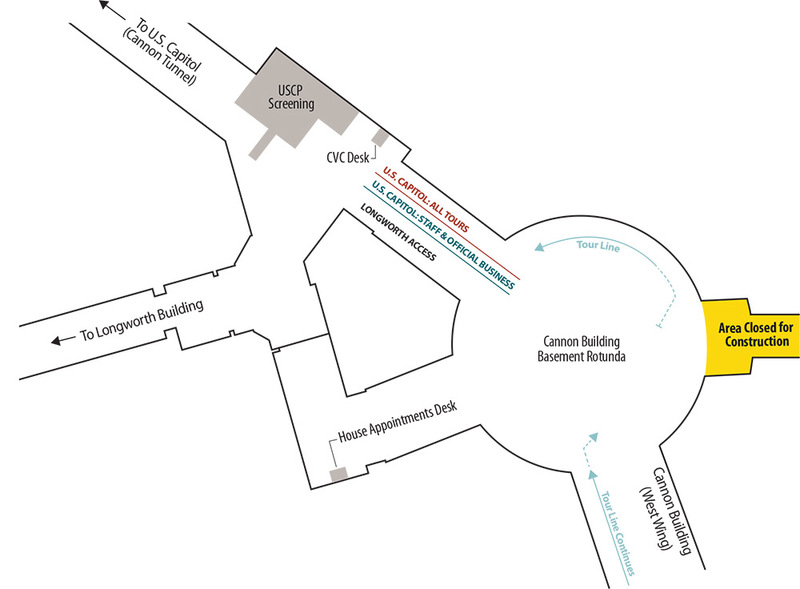 Visitors requiring access to the U.S. Capitol for official business can visit the House Appointments Desk, located to the south of the Longworth Tunnel (see map). The front entrance of the U.S. Capitol Visitor Center located along First Street, SE, is also available for staff-led tours. The Cannon Building's northwest entrance — located on the second floor at the corner of Independence Avenue and New Jersey Avenue, SE — is the entrance closest to the Capitol Visitor Center's front entrance. This staff-led tour route will remain in place for the duration of Phase 2. 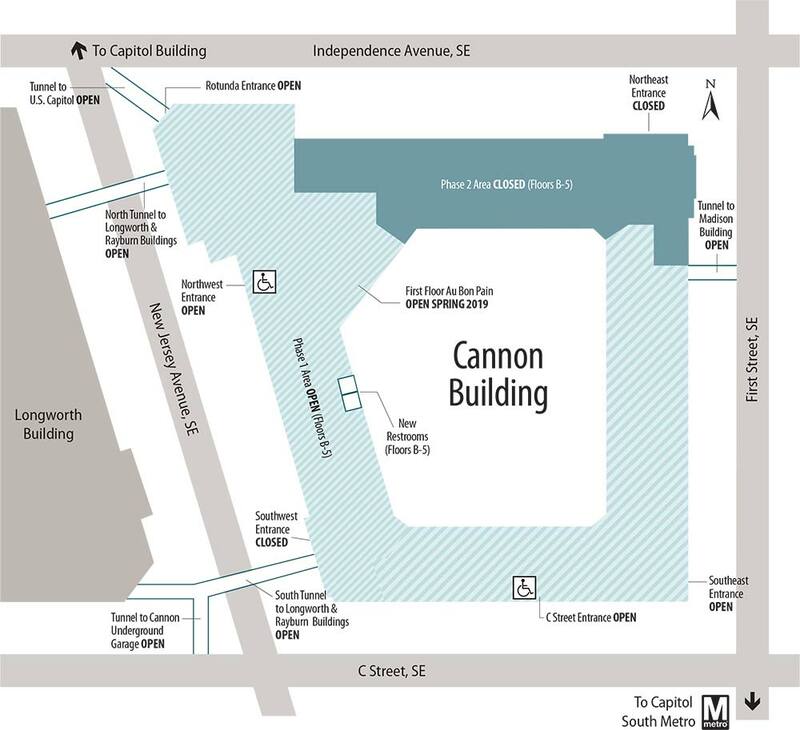 A portion of Lot 1 immediately south of the Cannon Building will be closed for the duration of the entire project. The Lot 1 site will house the contractor's construction offices and equipment. Please read our FAQs page or fill out the contact us form and select "Project: Cannon Renewal" as your subject type.